The other day I was checking out some linky party links and ran across these adorable little polymer clay pigs. They are called dirty pigs, and they are so cute! Being a big pig lover and collector (I use to have a pot belly pig) I just had to share these cute little pigs, dirty or clean their cute either way. 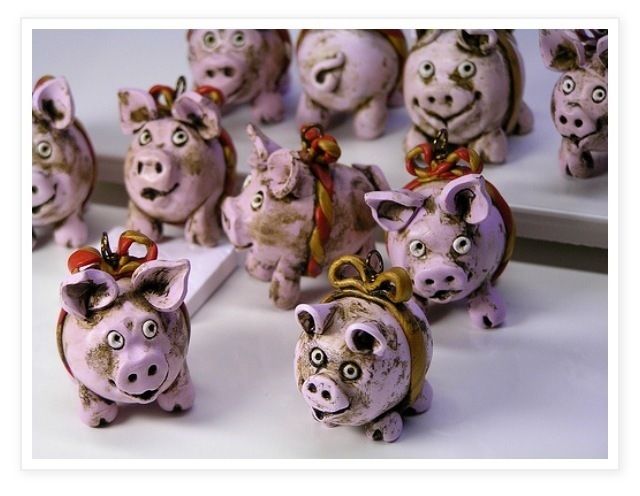 You can find the tutorial for making these cute little clay pigs at “Othel Lehto” blogspot. Susanna walks you through each step with instructions and pictures. Wonderful tutorial! While I was checking out Susanna’s blog I ran across other awesome tutorials like her faux metal beads. Stunning work! If you haven’t been to Othel Lehto yet, I suggest that you check it out. Susanna is a very talented artist!